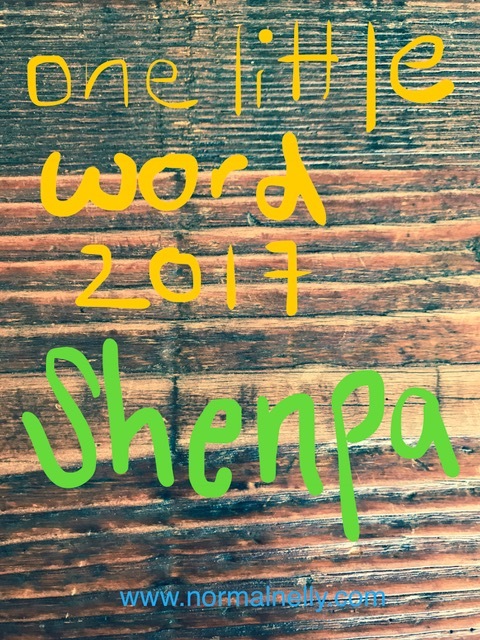 I’m sticking with the topic of “One Little Word” for the rest of January because I want to solidify my word, shenpa, for the rest of the year. I really believe in this strategy and I encourage all ya’ll to give it a go. As I introduced in the last post, “May I Catch My Shenpa Today, ” 2017 is the third year that I am following Ali Edward’s “One Little Word” strategy. She talks about choosing one word to meditate and focus on throughout the year, as opposed to a long list of complicated resolutions. My first word in 2015 was “breathe.” Talk about starting at the beginning! Haha! “Breathe” was a fantastic word for me, a meditation newbie, because it is the cornerstone of meditation and mindfulness. Focusing on the breath is the definition of being HERE, not there. My word for 2016 was “execute.” This was a nod to my perfectionist tendency of WAITING to do things until I am ready or until I have 1000% of what I need etc. etc. etc. I was sick and tired of postponing everything because “I can’t do it perfectly right now.” So I chose “execute” to focus on getting things done, whether or not they were perfect or complete. And it worked! Little things, big things… I was a lot more productive. As I explained last week, my word for this year is “shenpa.” Pema Chodron describes shenpa as an itch and an urge to scratch. It is a trigger that starts you down a path of habituated action…negative action. You might be thinking, why so negative? Most “one little words” are positive, like calm, happy, yes, gratitude etc. Well, the goal of focusing on shenpa is to catch it. Identify the trigger as close to the starting point as possible, so that I don’t travel as far down the path of anxiety before turning it around. Coming back to baseline. OK… You can start FOR REAL next year on January 1. Just consider the rest of this year a practice run. No pressure. Take your time choosing a word that speaks to you. What is something that you’d like to make a priority in your life? What is something you want to do more? Feel more? Pick one that jumps out at you and hold it in the front of your mind for the rest (it’s alright) of 2017. That’s it. You can do as much or as little with it as you want, but I promise you, just selecting that word will make you better at it. If you want to take it a bit further, you can repeat the word to yourself as you meditate, list all the ways you can take action using your word, brainstorm all of the synonyms and related topics to your word, or make a vision board. My go-to strategy so far has been to post my word in a place where I will see it every day. That’s it! I have all three words posted on a mirror that I walk by every day, and that is enough to keep it front of mind. I would like to/may eventually do more work with my word, but for now, posting it where I can see it everyday is enough. So, let me hear from you! If you’re going to give it a whirl, what’s your word? If you might do it/are thinking about it – what word jumps out at you? Do you have several words you’re deciding between? Let’s hear them!!! !